We are excited to introduce you to another new product! 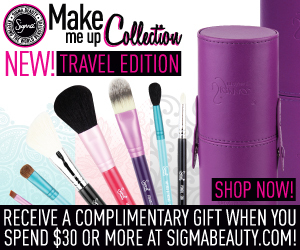 Sigma Beauty’s best selling Make Me Up Collection is now available in travel-size kits! The Sigma Beauty Make Me Up - Travel Edition was specially designed for a fun, yet practical makeup application. This kit contains seven travel-size brushes from our best-selling Essential Kit (E30 Pencil, E40 Tapered Blending, E55 Eye Shading, E65 Small Angle, F30 Large Powder, F40 Large angled Contour, and F60 Foundation). The Make Me Up - Travel Edition features four colorful travel kits: Make Me Blush (coral), Make Me Crazy (purple), Make Me Classy (black) and Make Me Cool (aqua). The brushes come in the traditional Make Me Up container that turns into two brush holders to keep you stylish and organized on the go. We created new affiliate banners for you! Update your blog with a new banner, and share this exciting new product information! To use one of the following banners, simply save the image to your computer, upload it as a picture to your blog, and insert your affiliate link as the URL! Be the first to share this exciting information with your followers! New product launches are a great opportunity to increase your affiliate sales! For more information about the Make Me Up Collection, click here! To use the banners, save the image you wish to use to your computer. Then, upload it as a picture to your blog. Don't forget to enter your affiliate link as the URL! there is any coupon code with this one too, that i can share with my followers? Gift from Santa sigma , thanks a lot. Yes! Vou preparar para o meu blog tb! Maravilhosos, já levei para o Blog! Lindo,lindo já vou colocar no blog..
nao consegui por a foto nova no blog pq???? Are you still doing the "Classy Affiliate" of the month? Lindos. Vou colocar no blog agora! Olá, sou afiliada e gostaria de saber se a alguma forma de pagamento com depósito bancário para quem não tem cartão internacional? @Perfume de Pitanga Yes, you can use Bank of Brazil for payment. Please contact atendimento@sigmabeauty.com to use this method of payment! The color of the cases and brushes are they bright pink or coral?